Mai Le lives a charmed life in Laguna Beach, and she is all set to spend her summer hanging out with her best friend Montana and pursuing a boy so important that she can only think of him as HIM. Her plans are abruptly changed when her parents announce that she will be accompanying her father and grandmother, Ba, on a trip to Vietnam. Their mission is to uncover the truth about what happened to Mai's grandfather, Ong, who died during the Vietnam War. Though Mai understands Vietnamese, she doesn't speak very much, and she is completely out of place in a culture she has only ever learned about secondhand. At first, she does nothing but beg to go home and seek out every possible opportunity to charge her phone. As the weeks wear on, however, she begins to appreciate her family's home country and the importance of closure for Ba. 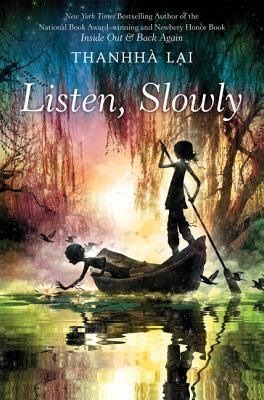 Listen, Slowly is unlike any middle grade novel I have ever read before. Author Thanhha Lai (whose 2011 novel in verse Inside Out and Back Again I have not yet read) fuses together the petty and superficial concerns of a boy-crazed middle school girl with beautiful observations about the Vietnamese culture, the impact of war, the differences between the Western and Eastern worlds and the experience of discovering one's roots. The language is poetic and atmospheric, if a bit dense, and information about the Vietnamese language, food, and etiquette are worked seamlessly into the story. Mai is a completely believable tween, as she struggles to reconcile her easy life in Laguna with what members of her family went through during and after the Vietnam War. She is also extremely likable, with a great voice, sense of humor, and sense of loyalty to those she cares about. Her personality combines the appropriate amounts of sass and sweetness for her age. With all these things going for it, however, I still have to wonder how Listen, Slowly will be received by the intended audience. The romance storyline is not played up enough to be a hook, and the questions surrounding what happened to Ong are not enough of a mystery to grab readers from that angle either. There is a lot of dense description, and entire sections of translated Vietnamese (mainly spoken by Mai's grandmother and her contemporaries) that are very wordy and often hard to grasp due to their overuse of adjectives and polite expressions. There are also a number of times where characters speak Vietnamese and it is not translated directly, which could make the book feel more difficult to read than it really is, especially if the reader is intimidated by unknown languages. Names are also an issue - there are lot of them, and because of the way people are addressed in the Vietnamese language, many of them are also very similar, so it's hard to keep track of who is who. None of these are flaws in the book; they are just factors that might unfortunately work against it given the many less demanding titles available for this age group. Listen, Slowly is beautifully written, unique and moving. It teaches about a country and culture American kids know little about and provides a lot of relatable background information about the Vietnam War, which serves to explain how the war affected not just Americans, but the Vietnamese, and their family members who have since come to the U.S. For classrooms studying this conflict, it will be an invaluable addition to the curriculum, and for kids who like to travel through books, it will be a wonderfully eye-opening journey. I like the sound of this one. Very unique story line. I've added it to my TBR list. Thanks for the recommendation. It's definitely very different. It made me want to look for more by this author. This does sound different from anything I've heard of. Thanks for the review. I will be on the lookout for this. I've been wanting to read INSIDE OUT AND BACK AGAIN, and this sounds equally intriguing. There's not a lot of books about this culture, but I agree that some of the issues you've brought up might make it a hard sell for some kids. But I could see it might work really well in the classroom. Inside Out and Back Again is on my reading list for the historical fiction reading project I'm doing this year. Reading this book made me really interested in reading more by this author. I agree that in a classroom with a teacher on hand to provide context and support, it would go over really well.